Here’s a cool way to tell the “piquancy,” or hotness, of a pepper. 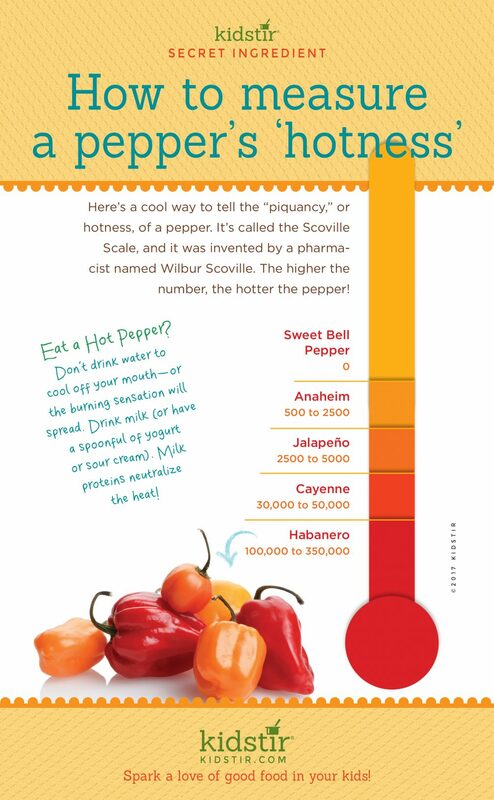 It’s called the Scoville Scale, and it was invented by a pharmacist named Wilbur Scoville. The higher the number, the hotter the pepper! Eat a Hot Pepper? Don’t drink water to cool off your mouth – or the burning sensation will spread. Drink milk (or have a spoonful of yogurt or sour cream). Milk proteins neutralize the heat! Once you know how hot peppers are, you’ll be able to decide which ones to include in your recipes like our Classic Salsa. Have your ever made salsa from scratch? Try this easy chunky salsa recipe with tortilla chips. It’s the perfect way for kids to practice chopping skills. Do your kids like Barbecue as much as dad? Have them help mix up a BBQ Rub to spice up those barbecued meat dishes. 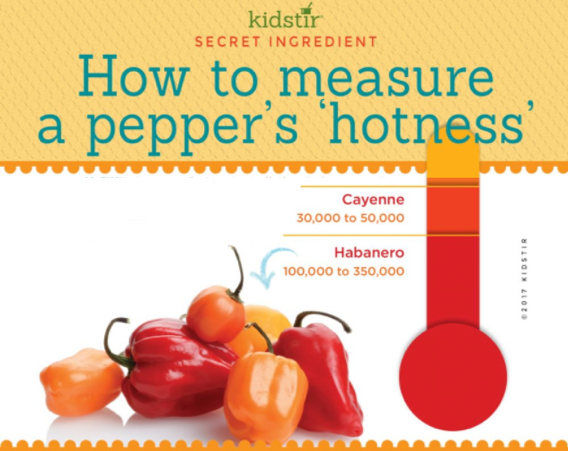 We’d love to offer Kids our “Measure Pepper Hotness” infographic for you to share on your blog. Just select and copy the code snippet below and paste into your next blog post. We’d love for everyone to share this page on social media or email by using the buttons below to share our Measure Pepper Hotness Infographic!